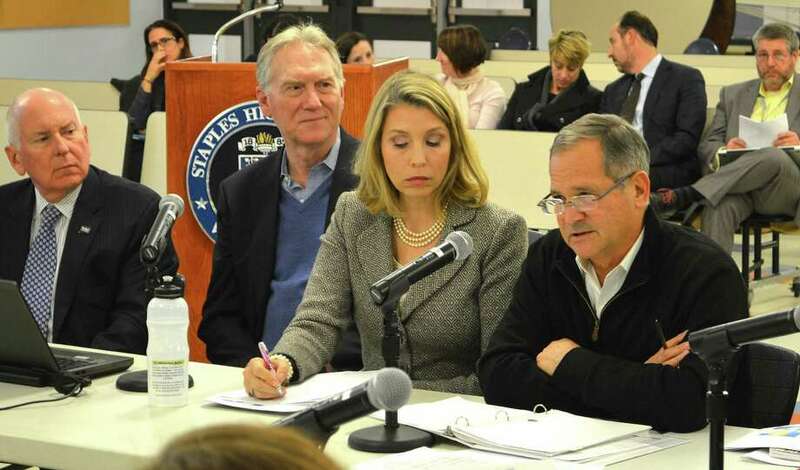 Board of Finance Chairman Brian Stern, right, addresses the Board of Education's meeting Monday, as from left, First Selectman Jim Marpe and finance board members John Hartwell and Clarissa Moore listen. Hoping to smooth the approval of the next fiscal year’s budget, the Board of Education on Monday hosted a visit from the Board of Finance. Financiers offered feedback and some “wish lists” for the budget season. They praised cooperation during last year’s budget process, stressed the need for continued “transparency,” and asked the school board to be open to doing things in different ways. A presentation on enrollment numbers right before financiers weighed in helped set the tone for the discussion, as consultant Donald Kennedy stressed that his forecast beyond three to five years may not have much value. “I wouldn’t put a lot of stock in anything that’s … beyond three to five years,” Kennedy said, though his figures show a continued decline in overall enrollment in the town’s public schools. “There are a lot of robust kinds of things happening in your real estate market … so to project anything with any real seriousness out beyond three to five years is more wishful thinking than anything,” he said. With current enrollment at 5,643 students in kindergarten through grade 12, Kennedy’s numbers show the numbers declining to 5,380 in 2020 and to 5,158 in 2025. “Do you think some of those problems could be cured with redistricting?” asked finance board member Lee Caney. “If we continue to get increased enrollment at Bedford I think we’re going to have a problem also,” he said. Board of Finance Chairman Brian Stern, taking a broad view of issues and projects facing the town, praised the school board for its work last year in coming in under the expected spending increase. The final approved budget for 2015-16 was just under $111.2 million. For the 2016-17 fiscal year, he said, he hopes the board can keep any spending increase at approximately 1 or 1.5 percent in order to help contain any overall rise in the tax rate. “We have a good shot at holding the equivalent mill rate flat this year again,” he said, calling it a de facto promise to the residents if the grand list of all taxable properties does not increase significantly. “It’s a difficult time for the homeowner … because the evaluations have changed over the last five years,” he noted, referring to the recently completed property revaluation program. Stern suggested the school board — and other town agencies — consider ways to consolidate expenses, as well as outsourcing opportunities. “Labor is just so expensive when you include all the benefits,” he said. He also urged the school system not to undercut maintenance, as it could increase the life of its buildings. Several financiers praised the school district’s “transparency,” which Caney said improved “dramatically” this past year. He and other finance members also asked the school to think outside the box. “We don’t want to hear, ‘This is how it’s always be done’ … We want efficiencies … Outsourcing is a great example (and) working collaboratively with the town on certain issues,” he said. Finance member Sheri Gordon asked the school board to be on the lookout for programmatic changes that could solve other problems, such as space issues. “When problems arise, when you get to issues like enrollment is getting high and we’re running out of space, one of things I’d like to see the board do is try to think differently,” she said. “There may be different directions that we can go,” she said.